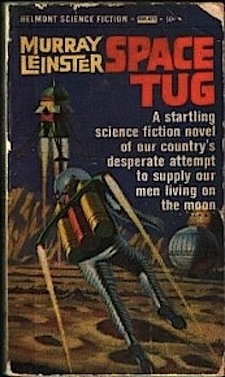 Fifties space yarn has some fascinating ideas for space flight and space technology. The story itself is fairly simple; you'll want to read this one for the gadgets and situations. Very well imagined by Leinster. 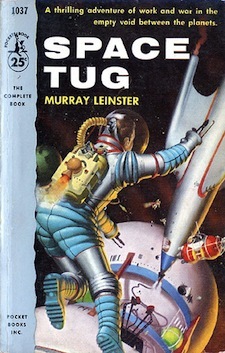 'Joe got out the gravity-simulator harnesses...' - Murray Leinster, 1953. Testing the 'ejection seats' for the new Constellation space craft. And thanks to readers who made 2,000 SF in the News articles possible! Here are at least three references to early exercising strategies in space. How many can you think of - before people actually spent much time in orbit? A nanoFET is essentially a micro-thruster; a postage stamp-sized rocket engine. Great flexibility combined with long operational life make it perfect for small devices on long missions. Not just for return to Earth, systems like this could help astronauts after a long weightless voyage to Mars. Serving tea in space is harder than you might think. 'Joe got out the gravity-simulator harnesses.' - Murray Leinster, 1953. Perfect for pushing your cubesat around. 'Joe got out the gravity-simulator harnesses... set for full Earth-gravity simulation. '- Murray Leinster, 1953. 'Joe got out the gravity-simulator harnesses. '- Murray Leinster, 1953. 'She's made of a combination of springs, levers, acoustic instruments...'- David Keller, 1928. 'Joe got out the gravity-simulator harnesses..' - Murray Leinster, 1953.